The poetic layers Ramke builds create spare rooms, secret passageways, and holographic catacombs, weaving them into a sacred geometry among language’s denotative, connotative, textural, and etymological melodies. Image and metaphor, yes; intellectual rigor and wandering, yes; conversations with personal, literary, scientific, philosophical, and spiritual touchstones, yes. These are poems of the mind and for the mind, investigating and honoring realms of thought and associational activity in process and on the page. (Ramke is known for this; his 2009 New and Selected Poems carries the title Theory of Mind.) Fuller, though, and even more accurate, would be to name his oeuvre a constellation of forcefields which evoke and animate forces. A sensualist, language student, and miner of airs, waters, places, Ramke continues to be one of our most overtly engaged, persistent, transcendent, high-profile contemporary poet of physics and metaphysics, furthering the work of American Moderns such as Stevens, Eliot, and Roethke. Most poets ponder love and time, life and death, nature and human nature. While this is true of Ramke as well, his relentless questioning into both subjective and objective realities creates “lines and layers” where consciousness meets quantum and cosmic patterns. His true subjects are the edges of things/conditions/insights, and how they nest within each other like Russian dolls and overlap like Venn diagrams. Where the Jungian multiplicity of selves and the mellifluous syllable scintillate, Ramke attends by capturing the moment. 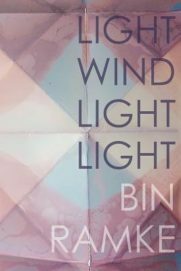 Light Wind Light Light, Ramke’s thirteenth volume, happily continues these key signatures. While the epicenter here, from a poet of a certain age, treats reflection—both in the physical, light-creating-images-through-dimension sense, and in the metaphysical, soul-contemplating-itself sense—it’s too simple to say that this is a book about memory. The title (and was there ever a more gorgeous title?) gives us thematic cues: he leaves out solid earth and rushing waters, as well as light’s more passionate incarnation, fire, to reflect more ethereal forces. The title also morphs into resonant possibilities—noun? verb? adjective? long “i” or short?—and suggests a spectrum of other mutable, multifaceted meanings within the covers. what was windblown wind formed. Birds do die but did live. The poet-mystic knows the quantum, the cosmic, the strings, the elements, the directions, the snake, and the spider. The poet-mystic knows that the void offers an invitation to create anew, “Isolating Splendor” as one of his titles puts it, in order to “Witness (The Modern Sublime)” as he says in another—in reflection, in melancholy, in contentment, in awe. This poet-mystic knows, and sings as he shows. This entry was posted in Uncategorized and tagged Winter 2018 on February 1, 2019 by Kelly.